Bristol VFX has developed this professional range of VFX frame systems to suit almost any situation where a green or blue background is required. All our systems are designed to be disassembled, strong, highly durable and easily adapted or tailored to fit your specific requirements. All screens are made from Bristol VFX industry renowned, durable, anti crease, brushed matt fabrics. Bristol supplies to most major film products in the UK, serving all key studios, making Bristol the professionals choice! Semi permanent, demountable, modular screening system such as the VFX100 and 200, incorporates a self supporting or wall mounted frame, complete with fitted screen, integrated colour matched cove and PVC flooring. Available in a wide range of formats and infinitely sized to nearest 100mm. Max height of 3m for the VFX100 and 10m for the VFX200. The VFX75 a portable, lightweight screen using Bristol's industry renowned, anti crease fabric. Ideal for small studios and shooting on the move. Professional lighting solutions can also be supplied, Bristol work closely with Photon Beard and other light manufactures. Creating a full turnkey VFX green or blue screen studio environment. Site survey and installation services also available, call for more information. 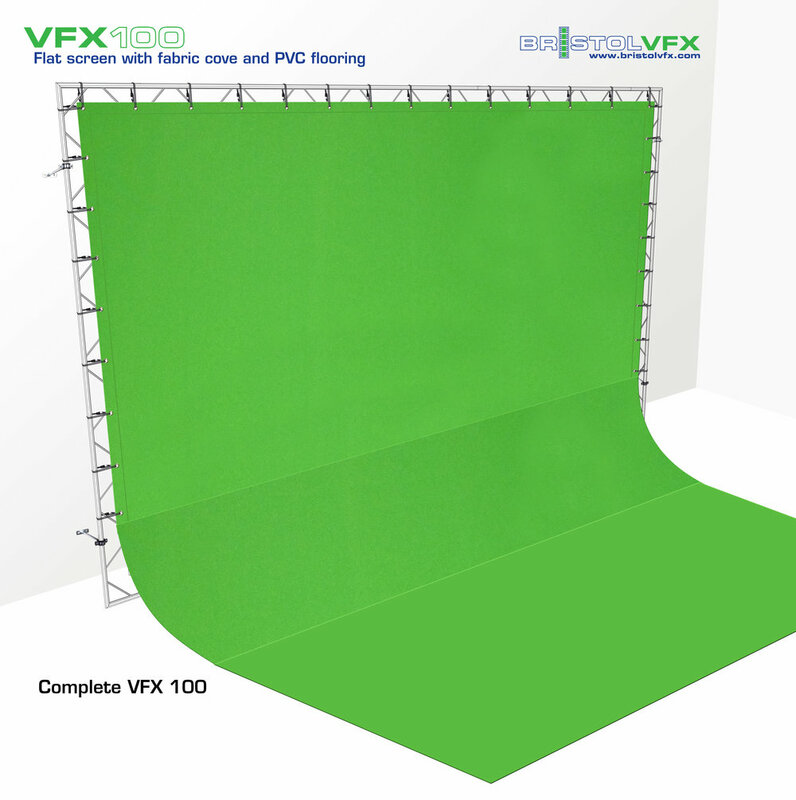 The VFX100 is a professional, green or blue screen semi permanent studio, the VFX100 can be easily dismantled and re-erected. Although of a modular makeup, all VFX100 systems are bespoke and tailored to the customer's size and specification. This system is of a demountable modular ladder construction, it is fabricated with a 25mm diameter lightweight aluminium tubes with 8mm diameter diagonal lacing spars. All ladder sections and joints are connected with internal spigots and secured with Allen keys grub screws. 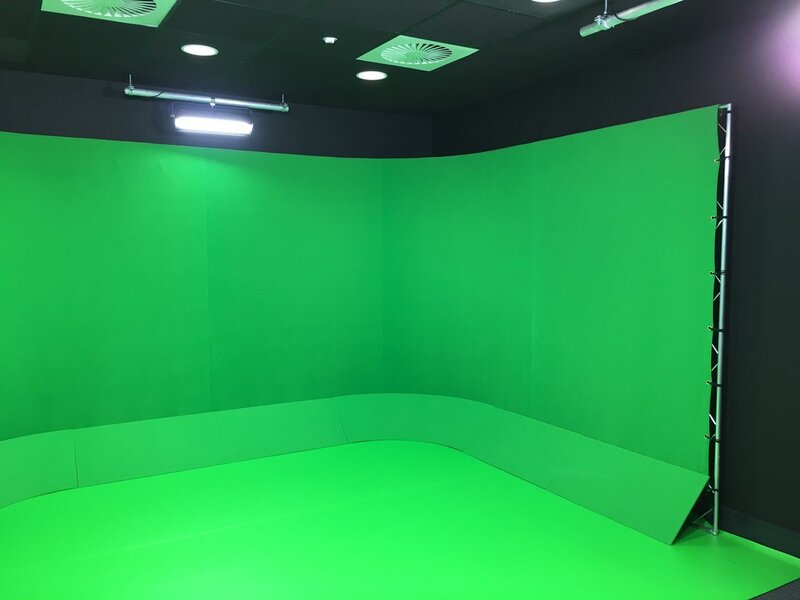 Bristol VFX can also supply a range of Photon Beard Highlight 110 - low energy lights fitted with a special cyclorama attachment. This fitting has been specifically designed to illuminate your virtual screen area correctly. Although the VFX100 system is designed to be structurally self-supporting, we do recommend for health and safety reasons the open ends of ‘L’ &’U’ format frames are tied back to an adjacent wall for added stability or if required to be free standing are fitted with stabilising legs. This consists of a rectangular frame with internal fitted VFXE or wrap around VFXB screen. Both options can be free standing or wall mounted. To enable full body shots screen can be extended to create a long fabric skirt extended forward towards the camera creating a natural curve between vertical and horizontal plain. Alternatively a short skirt can be fitted extending approx. 500mm onto floor with strips of VFX PVC Flooring laid over leading edge of screen towards camera forming a visually seamless join. Should the screen need to be self supporting, we can in addition supply necessary stabilisers and weight bags. This is a three sided structure with two internal corners, enabling a greater screen area to be created and suitable for the larger application, giving added versatility and an enlarged visual area. Each face is produced to the required dimensions between and either side of the corners. As with the ‘L’ Format above a VFXE fitted screen is used with a sectional, fabric covered cove sections following the base line of the framework. The cove consists of two corner sections with fabricated straight sections to infill between corners and to returns either side. These are secured to the VFX framework with demountable angle brackets. The floor area is covered with loose lay VFX PVC flooring, which is then tucked under leading edge of the cove to form a seamless transition from screen to floor. This system is supplied with all fixtures and fittings as required to secure to an adjacent wall or structure. Should your structure need to be totally free-standing, additional stabilizers and weight bags can also be supplied. Should you have a requirement for a specific shape we can usually modify the design of the components to suit almost all studio configurations that are presented to us. Bristol VFX recommends a site survey be undertaken for the more complex structures to ensure correct dimensions and that there are no unseen problems that might delay or affect the installation and implementation. We also offer an installation service which in most cases can be completed in one working day, we do also recommend the client has one of his own operatives on hand during the installation so they understand how the system is erected in case the system ever needs moving or relocating. The Bristol VFX75 Standard and Long are fully portable screens available in green and blue. All screens are made from Bristol VFX industry renowned, durable, anti crease, brushed matt fabrics. Bristol supplies to most major film products in the UK, serving all the studios, making Bristol the professionals choice. The VFX75 Standard is a 2.3m high by 2.3m wide flat screen, the VFX75 Long has an attached 2.3m fabric skirt, forming an infinity curve allow for full height shots. Skirts can be made to any length form fabric or PVC flooring. Please note Bristol VFX PVC flooring is 2 meters wide and will add approximately 5-10kg to the package depending on length, making the VFX75 less portable. However the fabric skirt only adds 2-4kg. Multiple VFX 75 can be linked if a wider portable screen is required. The VFX75 is the most popular pack-away system in the Bristol VFX range. This compact portable system is perfect for smaller studios, media events, CGI videotography, collages, schools, YouTubers, live streaming, social media and more. Largest of our modular semi permanent framing systems, able to carry the largest screen sizes up to 10 meter in height and unlimited width. All screens are made from Bristol VFX industry renowned, durable, anti crease, brushed matt fabrics. Bristol supplies to most major film products in the UK, serving all the studios, making Bristol the professionals choice. Screens are secured to framework using our elasticated ties or by conventional sash cord. System can also be used for supporting large scale ceiling pieces as well as flown screens. This is the largest framing system we produce and is generally used when the overall screen size is outside the parameters of the VFX100. The VFX200 is again of a demountable modular ladder construction, but is fabricated using a larger 50mm diameter lightweight aluminium tube with 12mm diameter diagonal lacing spars. All ladder sections and joints are connected with internal spigots and secured with M10 Nylok nuts and bolts for permanent installations or special quick release spring pins for temporary setups or standby applications. This system is ideal for supporting large format screens of up to 10m in height. The VFX200 can also be used for suspended ceiling pieces as well as lighting grid. Screens can be fitted into the frame using our elasticated span ties or conventional sash cord. Elements can be fabricated with ease of installation and transportation in mind, if a variety of ladder lengths are provided, multiple frame sizes can be quickly achieved. Ideal for studio, location and standby situations. We also provide a single 50mm tube fabricated frame system. Ideal for easy erect, VFX Standby frames and for supporting flying VFX Screens. Full details and formats available on request. Interested in finding out more on the origins of green screen? Read about the creator: Petro Vlahos. Bristol VFX also offer a screen fabrication service, which depending on size, specification and current work load can be produced within a few days. Larger projects do take a little longer but on a advise of sizes, specification and required time scale we can usually work out a suitable schedule to fit your requirements. The standard screen finish we provide is seamed to size, 2” (50mm) reinforced webbing hem all round with eyelets fitted at 12” (300mm) centre’s to perimeter. We are but a phone call away, with a defined screen specification provided will email a detailed quotation and estimated delivery by return.